Big Data Maturity Model (BDMM) is a qualitative method to show the growth and increasing impact of big data capabilities in an IT environment from both business and technology perspectives. It comprises a set of criteria, parameters and factors that can be used to describe and measure the effectiveness of the big data adoption and implementation. 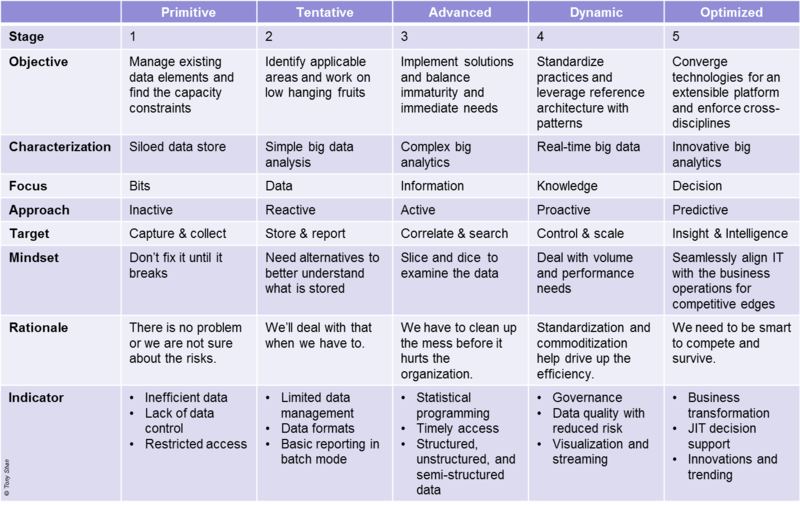 The Big Data Maturity Model is illustrated as follows. BDMM facilitates an in-depth assessment for an organization, which is typically conducted by seasoned professionals. It is followed by the strategy formulation for incremental adoption and iterative evolution of big data. By the way, there is an advanced version of BDMM, which describes fine-grained aspects such as value creation, risk management, compliance, competency, architecture, policy, security, organization, audit, etc. You may email the author for additional details and/or advisory. For more information, please contact Tony Shan ([email protected]).